As part of Air Systems International ventilation ducting, the SVH-15 is ideal for medium to long range job sites, including confined space work. 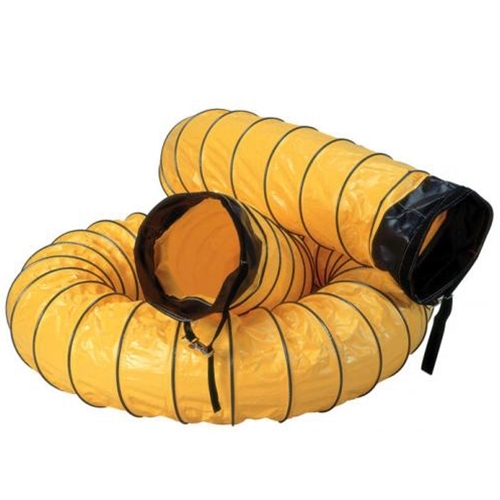 With 15 feet of yellow ducting, including adjustable cuffs on each end, you can set up and get to work faster and without worrying how your equipment will hold up. Air Systems International has been providing ventilation and breathing air solutions for over three decades – Developing and manufacturing internally as well as educating customers- allowing you to select a quality solution and stay within your budget. The SVH-15 is a vinyl polyester hose in yellow, ideal for high traffic work sites where a more inconspicuous hose may get damaged if other workers don’t notice or fail to avoid the run. The hose itself is reinforced with a steel hoop throughout the 15 feet of length, and the 6 inch cuffs at each end of the hose allow you to connect easily with adjustable belt straps. As part of a line up that includes 3 foot, 6 foot and 25 foot ducting, SVH-15 can be ordered standard as well as completely customized with specific wear strips and more. Air Systems International manufactures a broad spectrum of equipment and supplies, and custom orders are available in almost every category as well. Shop ducting, connectors and transition pieces to increase or decrease for multiple runs of ducting. Complete your ventilation and breathing air line up today with Intech Equipment and Supply and Air Systems International. Allow our experts to coordinate your standard or custom order, and provide valuable regulatory and compatibility information. Selecting the right equipment can be challenging, but with experts and extensive resources, you can take comfort in your selection and keep your focus on the tasks at hand. Put Intech Equipment and Supply to work for you today!